The July-August 2015 coal mining and coal ash disaster in Vietnam occurred in late July after heavy rains resulted in the major flooding flooding in Quang Ninh province. Major coal mines were flooded, a coal mine tailings dam burst, major roads in mines and connecting the mines to ports were damaged as were some coal port facilities. The breach of 'dam 790' resulted in coal mine tailings flooding through Cam Pha City with residents being evacuated. The coal mines and power stations are in close proximity of the Ha Long World Heritage site, with water pollution from the mines likely to affect the area. (2) Heavy rains and flooding caused much damage in 2015 in Northern Vietnam’s coal area, where most of the coal output of the country is produced. 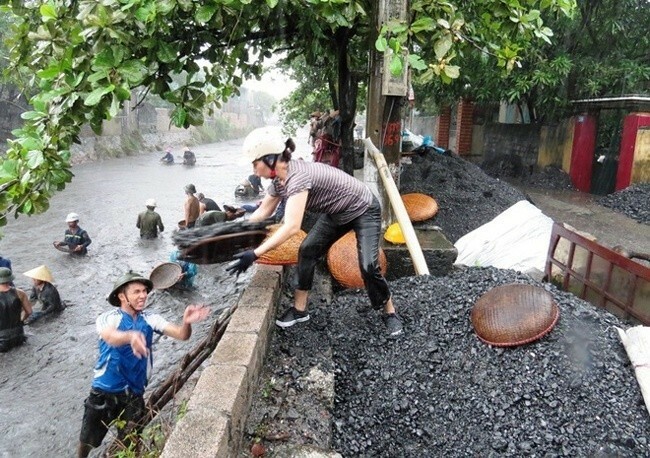 It was reported on Sept 11, 2015, that most of the Viet Nam Coal and Mineral Industries Group's (Vinacomin) 85,000 coal miners in coastal Quang Ninh Province resumed work after damaging torrential rains in July. The miners in Cam Pha and Ha Long cities, were still dealing with flood's aftermath and have yet to return to work. Ong The Minh, deputy director of the Ha Tu Coal Company under Vinacomin, said: “"We are draining off water and mud from mining field and expect to restart coal extraction in the dry season". After the incessant rains, two of the Ha Tu Coal Company's mines were completely submerged. The Hon Gai Coal Company, which has an annual generating capacity of 2.6 million tonnes, yielded only 5,000 tonnes of natural coal per day, half of normal production. Thanh Cong Coal Factory under the Hon Gai Coal Company had yet to restart operations after a breached void caused an accident on August 20 that killed two and injured ten. Mining field 917, also owned by the company, was still submerged 50m under water. In the Mong Duong Coal Company only two of its 15 units have restarted extracting coal so other Vinacomin companies provided temporary jobs to 500 of the company's miners. Vinacomin and its member companies pledged not to dismiss any workers. The catastrophic torrential rains and floods battered Quang Ninh Province from July 26 to 31. 2015. Vinacomin, known to have the largest coal reserves in the country, halted all coal production to focus on flood prevention and post-flood recovery (1). As a consequence of the floods, pollution from dozens of open-cast mines threatened the waters of Halong Bay, a World Heritage Site and a tourist symbol of Vietnam, with more than two million visitors a year. Environmental groups have denounced the problem for years, but alarms soared in August 2015 when the heaviest rains in four decades killed at least 17 people and pushed rivers of coal and heavy metals into the sea. Near Cam Pha, in Quang Ninh region, there are different mines managed by Vinacomin, that produce a great impact on the environmental situation of the zone and in the Ha Long Bay. With the rain, the coal mines leak a potentially hazardous toxic slurry including heavy metals arsenic, boron, barium, cadmium, chromium, lead, manganese, selenium and thallium into the bay, what have terrible effects on the water, the ground and affects the tourism, one of the main economical source of the area. Coal contains a lot of sulfur, which pollutes water very quickly. In some areas, it also releases acids and heavy metals like lead, zinc or mercury. All that dissolves in the water and contaminates the waters of Halong Bay. In the city of Cam Pha, the epicenter of mining activity just 40 kilometers from the bay, 70,000 million liters of toxic waste are accumulated each year, which local authorities do not know where to store. So far, Bay managers have not found a solution to address this problem. Although at first glance the landscape of the majestic rock islets has hardly changed, the seabed has resented, with the massive disappearance of corals and fish. The mangrove forests surrounding the bay, which are of inestimable value for their biodiversity and fundamental to avoid flooding and filter the water that reaches the sea, have disappeared, cornered by new roads, hotels and docks for the hundreds of tourist boats that every day sail through these waters. Unesco has successfully lobbied the Vietnamese government to limit aquaculture farms in the area and set higher environmental requirements for tour operators, but mining activity has been maintained to meet an energy demand that has skyrocketed in the last two decades. The latest climate disaster has revealed the inadequate preparation of many of these mines managed by the state coal corporation and its lack of adaptation to the weather in a country especially affected by climate change. Despite the timid steps taken in recent years to prevent disaster, the most critical voices fear it is too late. "As a tourist attraction, Halong Bay survives, but as a natural environment is dying". Project Details Quang Ninh area supports about the 95% of coal production of Vietnam. This data has a terrible impact on the environment. For example, to support such amount of production, the area for open pit coal mines has increased in the last 50 years out of proportion. From 1969 to 1974, in the Cam Pha mine area, about 42% at the forest land was reduced. From 1985 to 1991 about 79 ha of agricultural land was fond. Every year, Cam Pha mines consume water estimated over 2.2 million m3 and discharges to the sea about 9 million m3 of mining water. Cam Pha city stores the biggest quantity of sludge from the mines, about 60 million to 70 million cubic metres per year. Torrential rains occurred in the northern province of Quang Ninh over the weekend of July 25-26, and caused flash floods in Ha Long, Dong Trieu, Uong Bi, Cam Pha, Van Don, and Hoanh Bo. The floods and landslides that were triggered by the rainfall caused a number of deaths and resulted in widespread damage to houses, roads and other infrastructure. Viet Nam News reported that "the rainfall in Cam Pha township inundated many areas, such as National Road 18A and Cam Phu, Cam Son and Mong Duong wards, where water reached as high as the second floor of some houses." Authorities reported that 17 people had been killed in the floods and that a further six were missing. After only a short respite from the initial floods, heavy rain fell again - especially in Quang Ninh, Hai Phong, Lang Son and Bac Giang Provinces. Reports of damage to coal mines, coal infrastructure and coal storage at power plant. On July 31 it was reported that "a 3-meter long section of dam 790" which contained "sludge from coal mining" had collapsed, spilling its contents into Quang Ninh province’s Cam Pha City. The news report provided few details of the accident but stated that "repairs are underway and reinforcement measures have been taken to consolidate the dam." It was also reported that the floods has caused substantial damage to coal mining operations and transport infrastructure to the extent that coal supplies to coal-fired power stations were at high risk of being curtailed. "Following news of the flooding of coal waste through Cam Pha City concern was raised about the potential impacts of toxic pollution on residents, the local environment and the adjoining Ha Long Bay World Heritage site. The heavy rainfall and flooding events included the Cam Pha region, which has both coal mines and coal-fired power stations, as well as Cua Luc Bay which flows into Ha Long Bay. The area surrounding Cua Luc Bay includes a coal mine and both operating and proposed coal-fired power stations. Coal waste from mines and power stations can contain a wide array of materials dangerous to human health and the environment including heavy metals including arsenic, boron, barium, cadmium, chromium, lead, manganese, selenium and thallium. 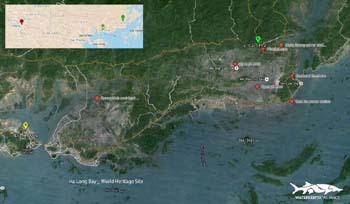 The Waterkeeper Alliance expressed concern that industrial coal waste spread by the floods “threatened the safety of citizens, wildlife and the Ha Long Bay World Heritage Site.” The boundary of the Ha Long World Heritage site is approximately only ten kilometres from the Cam Pha coastline. (2) The Waterkeeper Alliance expressed alarm days after the disaster first came to light that there were new reports of "severe flooding inundating the Lang Khanh harbor area and Dien Vong river with fresh leakages from the Quang Ninh coal-fired power plant. " They noted that the Ha Long Bay is adjoined by 5,736 hectares of open pit coal mines and 3 existing coal fired power plants" (2). Development of Alternatives After some studies about the impacts of the open pit coal mines in the Ha Long Bay and the area that surrounds Cam Pha, the goverment has decided close six open pit mines between 2014 and 2018 and a few more till 2020. This is first step to reduce the contamination that every year attacks the bay and the people. Why? Explain briefly. I don't think that to close some of the open mines in the next years will imply repairing the area and its environment or compensate people for the damage that all years of coal mining and living with coal ashes have produced. (2) July 2015 coal ash disaster, Vietnam. (This article is part of the Coal Issues portal on SourceWatch, a project of CoalSwarm and the Center for Media and Democracy). Contributor Alejandro Pradas Osuna, Máster en Gestión Fluvial Sostenible y Gestión Integrada de Aguas, Asignatura “Ecología política y gestión de aguas”.